Blood Moon Symmetry - Special Date January 5, 2015? What do I mean by symmetry? There is a perfect center date between the first blood moon and the last – January 5, 2015. There is a perfect center date between the second blood moon and the third and it also happens to be January 5, 2015. But even outside of the tetrad there were and are other blood moons. 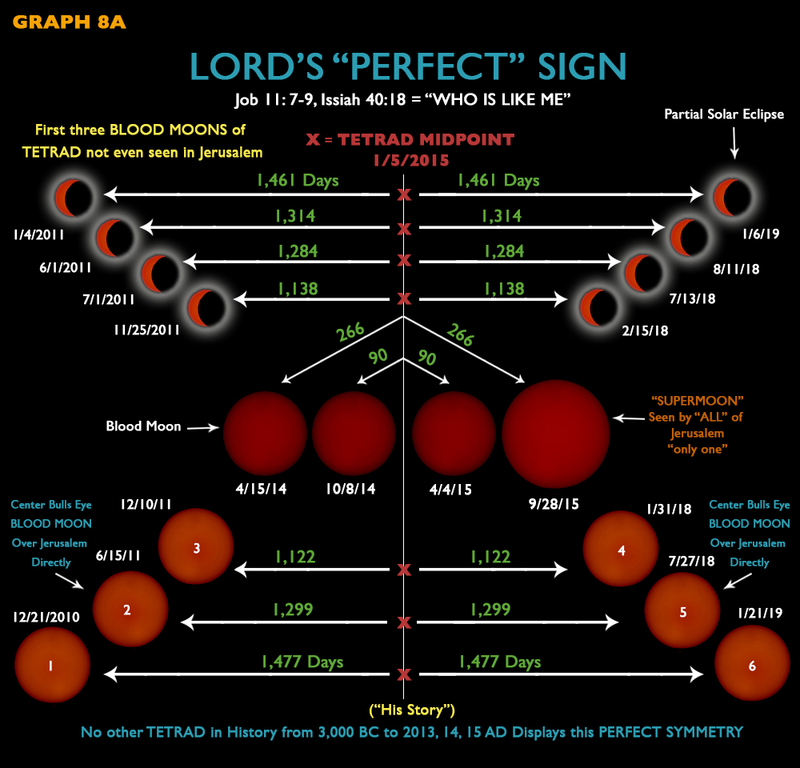 All three blood moons prior to the tetrad have perfect symmetry to the blood moons after the tetrad – January 5, 2015! What are the chances? This in itself seems to be a pretty amazing sign from God [Genesis 1:14-16]. As if that were not enough, there were four partial solar eclipses prior to the tetrad and four after the tetrad. Guess what? They are all symmetric as well….to the same date January 5, 2015! Again, no other blood moons display this perfect symmetry in the known history of lunar or solar eclipses! This is all shown in the chart below thanks to the research of Paul Grevas plus you can go check these facts out for yourself at the NASA website. So what does the Bible say about January 5, 2015? Nothing. So what does this perfect symmetry mean? We do not know. But it is something to certainly watch, particularly when it comes to the nation of Israel. Historically, the bloods moons on feast days were an ominous warning of bad things to come, like war, genocide, and inquisitions, but in the end, salvation for the nation. The Bible does certainly prophecy about the Great Tribulation to come for Israel where 2/3 of the Jews will be slaughtered mostly by the power of the Antichrist. Could January 5th be a day of significance for Israel? I do not know and I do not set dates. However, something very significant seems forthcoming between the January 5, 2015 and the final blood moon September 28, 2015. The final blood moon is a “Supermoon”, the only one seen by all of Jerusalem. I would watch the nation of Israel during this time to see how the nations (U.N.) treat Israel, how Obama treats Israel, and what natural catastrophes occur during this time-frame. What the Bible does says will occur in the end time is that a covenant of some kind will be confirmed or strengthened by the Antichrist. A temple will likely be built on the Temple Mount and daily sacrifices will resume; then the Antichrist will stop the sacrifices. At the midpoint of the final seven years, the Antichrist will be given power to destroy. After the 3 1/2 year Great Tribulation, the Abomination of Desolation will take place. Then the Church will be raptured. Then the wrath of God will be poured out on the earth. All of these, somewhat radical, notions are absolutely proven in my articles and charts on this site through Bible prophecies. The timing of these bloods moons is not the rapture or the Great Tribulation because the final seven years has not even begun because no covenant was strengthened by the Antichrist. Also, the Jewish temple has not been built. However, it would still be beneficial for you to watch what may happen in the year 2015. I have heard of the red moon or blood moon but never saw one. I think it is big and red. I also heard that Jupiter and Saturn came together a few days ago and made a huge and bright star. I think it has something to with Jesus because in the bible it says Jesus is coming back. I have only recently heard about the blood moons. rebuilding of the temple in Jerusalem. Cyrus is an OT archetype of Christ.